Viber is a fantastic VOIP calling service that lets you make free calls and send free messages to other Viber users. It’s good enough to make it to our best apps lists on Android and iOS. And it’s just got even better with Viber 4.1 as it has launched Viber Out, a new feature that allows users to make low-cost calls anywhere in the world, to mobile or landline phones. 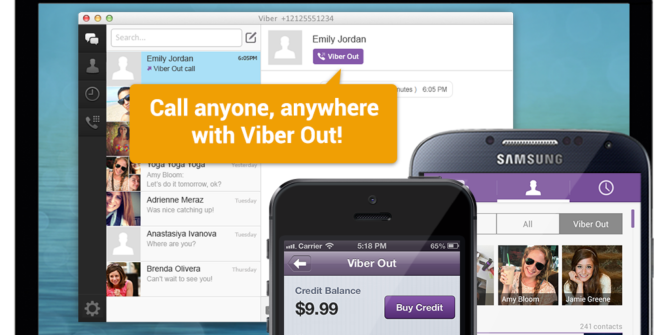 Viber Out currently works on Android, iPhone and desktop. It will be coming to Windows Phone in the future. You will need to buy “credits” to make a Viber Out call, which is a simple in-app purchase through the Play Store or App Store, or using a credit card via Viber Desktop. It’s things like these that take Viber 4 to a whole new level Taking Viber For iOS 7 To A Whole New Level Taking Viber For iOS 7 To A Whole New Level The latest version of Viber (4.0) was recently released. But how I wished it looked like this. Read More . Also, unlike Skype, Viber Out displays your real phone number to the recipient so he or she knows who is calling. Further, Viber on desktop has your phone’s address book so you don’t have to remember numbers or dial them manually. Speaking of contacts, Viber 4.1 also has a new contact filter to better sort your contacts, which should make it easier to call and message people. Also, the update brings many new free and paid stickers in the Sticker Market, which was first introduced in Viber 4.0 Viber 4.0 For Android & iOS Introduces Push To Talk & Sticker Market Viber 4.0 For Android & iOS Introduces Push To Talk & Sticker Market Read More . Viber 4.1 is available to download for iOS, Android and desktop from the official website or the respective app stores. Not such a big deal : One can find today world phone services for one cent the minute. any such app for iOS 7? Asking for the administrator password for desktop even to install...no thanks! Thanks for the feedback on that. We're looking into this issue these days and we hope to find a solution in future updates.